After a troubled production, multiple directors, and general rumours, fans came to the conclusion that Solo, the new Star Wars spinoff was going to be a failure. However, now that Solo is finally upon us, all previous doubts have been dispelled and thank goodness! I, like most other followers of the series, was concerned when Lucasfilm announced that the new spin-off movie would be based around a younger Han Solo. It wasn’t so much the premise which made me uneasy, just the fact I didn’t think they could pull it off successfully. For me, what defines Han Solo as a person isn’t his blaster (the DL-44 for all those of you who haven’t been enlightened), it isn’t his ship – the Millennium Falcon, or even his best friend, the ‘walking carpet’ Chewbacca. It’s Harrison Ford. The swagger, arrogance, and hints of vulnerability which he layered his performance with offered up an anti-hero of the greatest calibre. Ultimately, Han Solo is just a guy who wants to make a quick buck and doesn’t care about anyone except himself when we first meet him in Tatooine. Through the original saga though, part of the joy of watching Harrison Ford effortlessly cruise through situations as Han Solo was the fact that we could see this man develop realistically as a person, rather than just a 2D character. So, how could it be possible to replicate such an iconic performance portrayed by such a well-known actor? Could it be done? In short: yes, it could. Alden Ehrenreich gives a performance that offers up enough of Ford’s mannerisms to be believable but also adds an adequate amount of his own personality so that it is memorable. I’m not suggesting for a moment that this is an Oscar-winning performance in any way (God help us when we give Oscars out to spin-off movies); but from the ‘Fire Alden Ehrenreich’ petitions and the angry mobsters repeatedly standing outside Lucasfilm with pitchforks demanding a re-cast, I am pleased to say such uproars were completely unnecessary. His commanding performance still manages to shine through the talents of Woody Harrelson, Donald Glover, and Emilia Clarke (playing Beckett, Lando Calrissian and Qui’ra respectively) which is no mean feat. Of course you could argue that this is natural, after all he is the lead, but with a cast of such vibrant characters, it is easier for Ehrenreich to get lost than you might think. Ehrenreich knows when to turn on the ‘Ford’ persona but also knows when its okay to show a slightly different side of a character we are all used too. 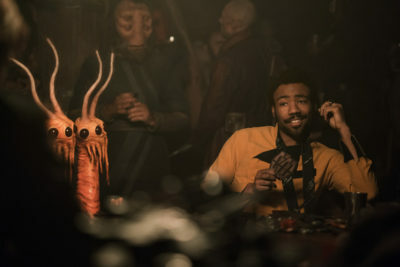 Donald Glover is perhaps the most obvious talent in Solo, and from the moment he was cast, way back in October 2016, there was no out in my mind that he would give a satisfying performance. Billy Dee Williams’ boots were large ones to fill, but Glover still manages to pull it off. But the main flaw of Glover’s performance is that he is too invulnerable, meaning it’s almost too good to be true when late in the plot he loses someone close to him and becomes slightly withdrawn. Playing L3, the sarcastic yet amusing robot who travels with Lando, is the British actor, Phoebe Waller-bridge. She offers the comedic side of this film but is unfortunately taken away as an asset far too quickly than needed. In comparison to previous android entries, she ranks highly, but still is over shined by Rogue One’s K2SO, whose sharp wit cannot be dismissed. John Favreau voices Rio Durant, a monkey-like being who is part of Beckett’s original crew. I particularly enjoyed Favreau’s performance here, as he produced a solid, likeable character, which films today always seem in lack of. His performance is even more impressive considering the small amount of screen time he had, yet he still made a strong impression on the movie itself. The last two additions to the casting are the aforementioned Emilia Clarke as Qui’ra and Paul Bettany as the film’s primary antagonist; Dryden Vos. Paul Bettany (a Ron Howard favourite) is fantastic as Vos, playing a cold, sadistic sect leader of a criminal cartel led by ‘Crimson Dawn’ (think angry branch manager of an Asda gone wrong). Although the character is a little one-dimensional, Bettany is able to bring out the best in him and gives the character much more depth than some in the saga. Fingers crossed he will appear again. Emilia Clarke is possibly the weakest link in the film, not because she plays her part badly, more the fact that she plays two different parts during the film. We are led to believe that in order to escape her homeworld, Qui’ra has had to do some ‘terrible things’ and sometimes these tragedies do come through in her personality, however for the rest of the film, Clarke acts as normal – as the same person we met at the beginning of Solo, leaving a lot to be desired through her performance. This is a spoiler-free review, so I am going to stick to that. However, I am going to say that the plot feels simple. Rather than events happening on one journey it feels a bit more like different events being stitched together. That’s not to say the situations Han and his intergalactic co-workers find themselves in aren’t fun and exhilarating, it’s just that they seem to be similar to the last. Visually, Star Wars films are renowned for their effects and this film is no exception. The joy of watching the Millennium Falcon hurtle through space is as fun now as it was in 1977. Perhaps even more so now that then as a result of CGI being at its most developed with this film’s release. From the visuals, you can feel the love and attention which has gone into Solo. Small details on the Falcon, the close-up shots Han unbuckling his holster, small things which you can tell the cinematographer (Bradford Young) has worked hard on to accomplish. Pacing wise, this film is great…until the third act when where the plot drags a little, but nothing major. Ron Howard’s pacing in most other parts of this movie is fantastic, teasing both normal people and Star Wars fans alike with small morsels of references on how Han claimed his most famous items. 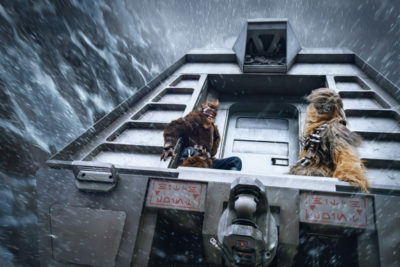 An example would be when Beckett and his crew are sitting by a fire, with Han and Chewbacca having just joined the party. As Beckett instructs Han how to survive in the world of con men and smugglers he slowly deconstructs a rifle looking suspiciously like….No, it couldn’t be, could it? Han’s signature weapon the DL-44. The way that Howard gives us a taste of what something could be and then gives us a reveal gives Solo one of its biggest strengths. The music is good in this film, but is the cause of one of my biggest criticisms: Star Wars can claim to have the most well-known score in history, but it relies too heavily upon John Williams’ original. It isn’t a huge problem, as the original music of Star Wars is stellar (anyone who says otherwise clearly hasn’t experienced the fear of being lowered into the Sarlacc pit by a mob of angry Star Wars fans) but while Solo does have a theme tune, its usage is minimal, meaning the most iconic tunes are preferred, leaving the original music not at all memorable. Solo: A Star Wars story is a fun, action-packed adventure whose flaws lie in chemistry and repetitiveness. These flaws are widely outspoken however, as Ehrenreich excels playing young Han and the bond he and Chewbacca share, which develops over time, is a joy to watch. If this is the standard set for future spin-offs, let’s hope they stick to it.